Forever underestimated and overlooked, Odonata has always been a prime choice of Archwing for Jordas Verdict. In fact, most speedrunners use teams made up of at least 4-5 Odonatas, due to it’s ability to buff your teams damage output and make the final boss fight a lot easier. 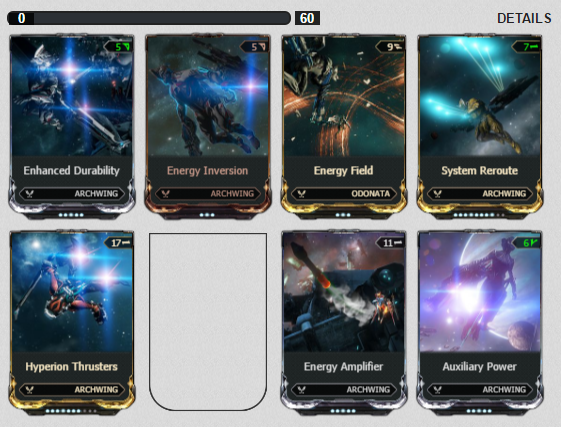 Don’t discard it just because it is the first archwing you tried out. Your second skill, Disarray, is an important and cheap survivability tool. It will stun most enemies around you, and destroy any missiles pursuing you. Especially useful during “soccer duty” as missiles will be coming at you nearly all the time. Your fourth skill, Repel, is also a defense mechanism. It will damage and knock enemies back in a very large radius. With enough strength and efficiency, it can be used to quickly destroy large groups of hostiles via repeated usage. Repel used to be able to push the spores very quickly and across great distances until very recently. We are not yet sure if the change was intended or not. If they revert it, please remind me to update this post. Your first skill, Energy Shell, is the reason Odonata is desirable in the raid. It works the same way as a Volt’s Electric Shield - any shots passing through it gain double critical damage and 50% bonus fire damage. The fire damage portion of this stacks with multiple shields. Bringing Energy Field ensures you can bestow this bonus to allies as well and, likewise, they can grant you their own shield for incredible total damage output. With just one Energy Shield applied, a Velocitus will deal over 180,000 damage with each critical shot! With each additional shield, it gains approximately 20,000 more damage. While outside, always stay on the move. Even without using afterburners, you move faster than Jordas’ missiles. If you have to stop, or push a spore, check to make sure there are no missiles in pursuit.